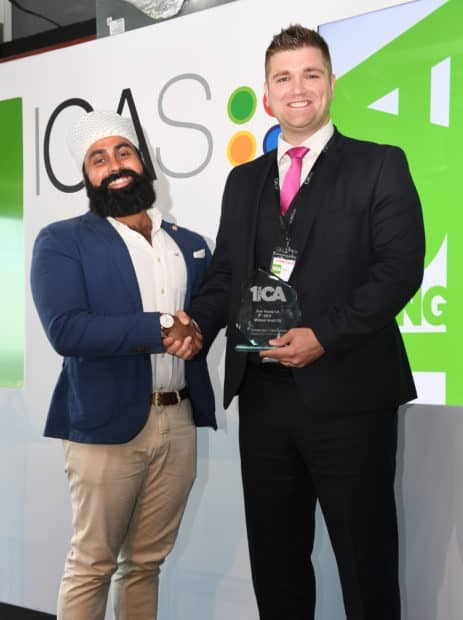 A Fife accountant has been selected to represent the chartered accountancy profession across the world, after winning the ‘One Young CA’ award at the Institute of Chartered Accountants of Scotland (ICAS) Young CAs Summit. Michael Scott CA (32), a Supervisor based in the Glenrothes office of EQ Chartered Accountants, was presented with the award at the summit in London on Thursday 21 June 2018. Michael Scott being presented with the award by 2015 winner Inderveer (‘Indy’) Hothi. Each year, ICAS issues a call for nominations of CAs under the age of 35 from all around the world who are excelling in their professional lives, representing the best of ICAS in the worlds of finance, business and beyond. Michael was one of 100 young CAs to reach the shortlist and was then delighted to achieve the accolade of ‘One Young CA’. Michael, who joined EQ in 2011, began his five year CA traineeship in 2012, one of the first to go through the five year direct entry route. He is now part of the firm’s Research and Development and Technology teams, where he identifies areas that he can assist clients by providing advisory support. Earlier this year, Michael was announced ‘NQ of the Year’ at the PQ Magazine awards in London. These awards recognise the hard work of newly qualified accountants, as well as those who educate them on their journey. Outside of work, Michael is deputy group leader with children’s charity HCPT and treasurer of Fife Gingerbread, a charity supporting vulnerable families. Employing over 100 staff, 31 in the Glenrothes office, EQ seeks to provide an environment where each and every member of the team has the opportunity to grow both professionally and personally to fulfil their aspirations. EQ works closely with ICAS to recruit and support new Graduate trainees who take up their positions across all offices each August. EQ also place strong emphasis on continuous learning and support beyond the standard obligations of a training firm by providing a varied work and training experience. For more information about Michael’s achievement, visit https://www.icas.com/ca-today-news/michael-scott-named-icas-one-young-ca-2018. For more information about EQ Chartered Accountants, visit www.eqaccountants.co.uk.